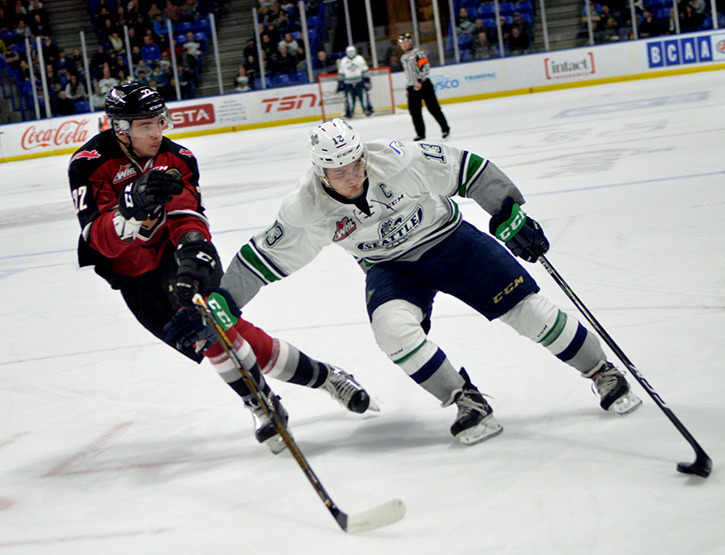 Vancouver Giants defenceman Marcus Kichton and Seattle Thunderbirds Elijah Brown collide during WHL action at the Langley Events Centre on Nov. 12. Each player scored their first career WHL goal in the game with Seattle winning 5-3. Coaches talk of the importance of emotion and being invested in a hockey game. To be successful, a team needs to feed off that energy, harness it and use it to their advantage. And the Vancouver Giants should have been energized. In their previous game, the team knocked off the Western Hockey League-leading Prince George Cougars — who happen to be ranked third in the Canadian Hockey League — by a 4-2 score. Instead, the Giants played a flat, uninspired effort, losing 5-3 to the visiting Seattle Thunderbirds in WHL action on Saturday night at the Langley Events Centre. The loss dropped Vancouver to 9-12-0-0 while Seattle improved to 8-8-0-1. “The game of hockey is played on emotion in my eyes and if you don’t bring it to the rink, it is tough to play, it is tough to win in this league,” said Giants coach Jason McKee. The Thunderbirds led 2-1 after 40 minutes, despite managing just 10 shots on goal. “I don’t think either team pushed anything, the opportunity was there throughout the first two periods to take control and we just didn’t do it,” McKee said. Seattle took control of the game with goals less than three minutes apart in the first 8:18 of the third period. Scott Eansor picked up a loose puck and after Vancouver goaltender Ryan Kubic stopped him the first time, Eansor deposited the rebound. And a few minutes later, Bryan Allbee’s shot trickled through Kubic’s legs and before anyone could sweep the puck out of harm’s way, Nolan Volcan poked the puck home. At that point, the T-Birds had four goals on 13 shots. Vancouver did make a game of it as defenceman Marcus Kichton scored his first career WHL goal, taking a pass from Tyler Benson and beating Rylan Toth with a wrist shot through a screen. This was at 10:21 and the goal seemed to spark the Giants. “You can’t fake it — you can’t pretend to be emotionally invested in this game, you have to be emotionally invested and we didn’t show that until about the 10-minute mark in the third,” McKee said. With less than two minutes to play, James Malm took a pass from Radovan Bondra and snapped his third goal in the past two games to make it 4-3. Seattle would ice things after stealing the puck in the offensive zone and burying the empty-netter off the stick of Donovan Neuls. Ethan Bear had opened the scoring midway through the first for Seattle and after Elijah Brown made it 2-0 70 seconds into the second, defenceman Matt Barberis got the Giants on the board less than two minutes later. Vancouver did have the better of the chances, including a post in the second period and another play were the puck hit a Seattle defender and was heading towards the goal before being cleared away. The Giants also hit a crossbar in the third. “It is tough to put your finger on,” McKee said when asked about the lack of emotion. Another factor in the loss was the special teams battle. While the Giants only took one penalty — which they killed off ——he team could not take advantage of five power-play opportunities. “We got outworked. It looked like our five-on-five game a lot of times too, we didn’t win enough battles and races and the chances we did get, the goalie made one real good save and then we missed the net on the other ones,” McKee said. The Giants are back in action on Wednesday (Nov. 16) when they host the Prince Albert Raiders at the LEC. Game time is 7 p.m.
“The feeling right now isn’t great. We felt like we let one slip away and that’s on us,” McKee said. Final shots were 29-22 for the Giants. Vancouver’s Matt Barberis was the second star while Seattle’s Scott Eansor was the first star and T-Birds teammate Matthew Barzal was the second star. Barzal was playing his first WHL game of the season after being sent down by the New York Islanders earlier in the week. The 2015 first round pick of the Islanders played in two NHL games before being sent back to junior. He had one assist against the Giants. Seattle’s Matthew Barzal made his WHL season debut after the New York Islanders returned the 2015 first round draft pick back to junior earlier this week.